An artist's rendition of the new OpenRoad Toyota Richmond dealership in Richmond, B.C. 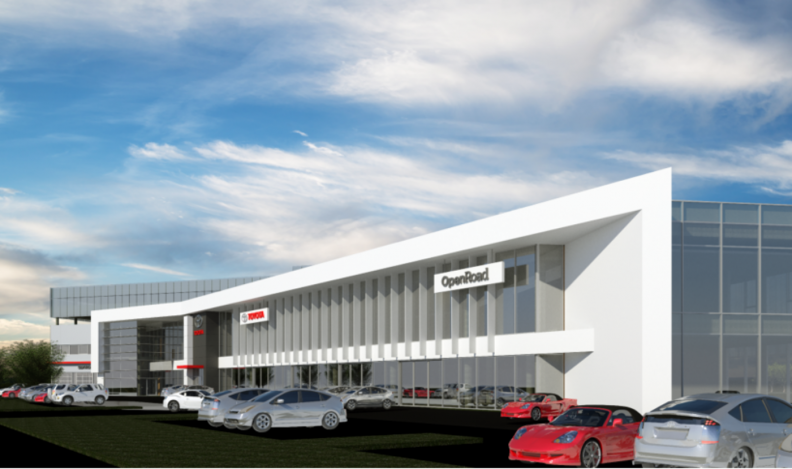 Construction begins this month on what will be the largest Toyota Dealership in Canada: a state of the art showroom and service facility for OpenRoad Toyota Richmond in Richmond, B.C. At 205,000 square feet (19,045 square metres), the new facility will feature two lounge areas, a children’s play area, plus a full-service café with TVs, a fireplace and WiFi access. The new vehicle showroom space will encompass more than 15,000 square feet (1,393 square metres) alone, making it the largest Toyota showroom in British Columbia, with space to display 36 vehicles on two levels, plus 10 indoor new-vehicle delivery bays. The dealership will also have a 12-bay drive-through reception service, 30 full mechanical service bays, and four express service bays for routine work such as oil changes. There will also be two automatic carwashes and six detail bays. “Our new dealership will be five times the size of our current location, and incorporate many environmental systems as well as more space to showcase and service the full range of Toyota models,” said Christian Chia, dealer principal at OpenRoad Toyota. When it comes to the environment, the new dealership will include a green roof and water collection system on the car wash, high efficiency heating and cooling systems, LED lighting, and more. Toyota Canada didn’t say when the dealership, which is being built across the street from the current location, will be open for business.